Lani is using Smore newsletters to spread the word online. April 2 ~ Autism Awareness Day - Light it up Blue! 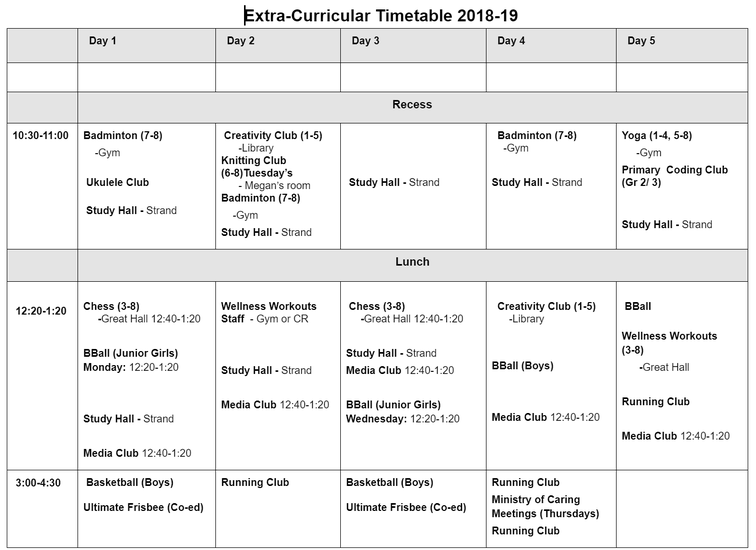 ** see our extra-curricular calendar below for opportunities available throughout the week at morning and lunch recesses. Thank you to our incredible staff for making these possible for students. As we begin second term, we look ahead to growing students to prepare for them for the next year of learning; looking at how far they have come and focusing in on developing those next steps outlined in your child’s term one report card. In classrooms, staff have been working towards our school-wide goals in mathematics, literacy and building resiliency in our students. Our school learning plan can be found on the school website as well as in this newsletter. We have also seen some shifts in our staffing. We welcome Ms. Melissa Ross to our grade 5 classroom who will be teaching on Friday’s in Ms. Dudley’s classroom. Mme. Shannon Vooys joins us in our primary/junior Core French position for the rest of the year while Mme. Walsh is on maternity leave. Congratulations to Mme. Walsh and her family on the birth of their second son Andy (Andrew) who was born on Valentine’s Day! Ms. Diane Smith also returns part-time to our intermediate division and we welcome her warmly back to her Lancaster family. 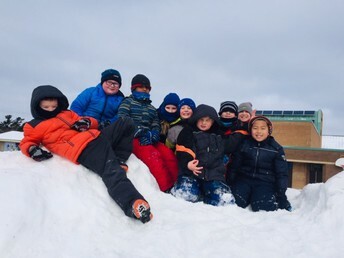 We have enjoyed many extra-curricular and team sports over the winter term with badminton, media club, creative club, wellness workouts, study hall, chess club, drama club and basketball teams all keeping students active and engaged in school life. Many thanks to our ministries for helping to run our Jump Rope and Hoops for Heart event, Valentine’s Spirit week, Movie night and Sharing assemblies. We are fortunate to have so many outlets for students to collaborate, participate and lead. It will soon be time to dust off our running feet as running club starts up after March Break, preparing runners for the spring road races and track and field meets. Many of our teachers are using technology (e.g. Remind, classroom Twitter sites, Brightspace digital portfolios, Class Dojo) to openly share information and communicate classroom learning experiences. For school-wide communication of exciting learning events, follow our Twitter handle: @LancasterPS_LDSB. Our Remind code is @lancasterd. The school's website is: https://lancaster.limestone.on.ca/. The school messenger app now being used to report absences also pushes out system-wide and school-specific messages. These online communication tools help ensure you stay informed and connected about exciting events at your child's school. Thank you to our staff and parent community for your support of the learning activities, fundraising, and mutual support as we all work toward supporting our students to help them grow and succeed to their best potential. It is sometimes a journey that can present its challenges and it is with that strong partnership that we are able to achieve the best outcomes possible. 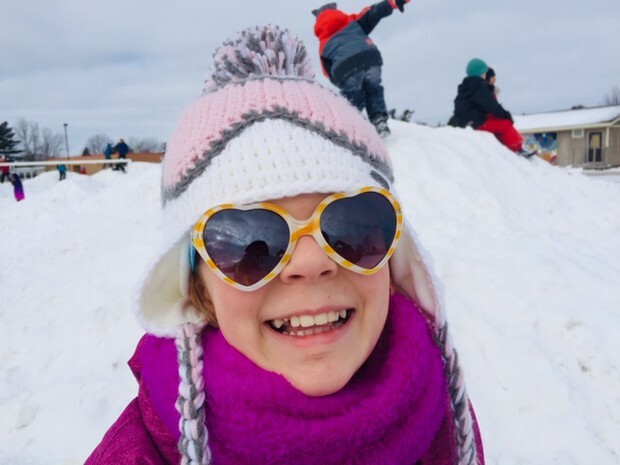 We wish all of our families a safe and fun-filled March Break and look forward to the spring weather and longer days ahead. Your parent council has been hard at work focusing on the many ways our parent community can support our children’s education and environment. Your parent council recently paired with the administration to purchase a very special tool box. The tool box was on display during the movie night event and will be used by our dedicated teachers to teach new skills. The council is very excited to support our teachers with these great tools. More to follow! In addition to the tool box, the council purchased a portable green screen for the school. This purchase will support future activities and can be used at social, sport, or general gatherings. Our staff have been exploring and using green screen technology and have great ideas and plans for the use of the screen. The Parent Council has received news about the Limestone School Board’s planned infrastructure improvements for the schools entrance. Many of the councils safety points have been adopted in the overall plan as well as a plan to investigate the drainage issues with the kinder yard. This is very exciting news and is a great start to any improvements to our schools yard. 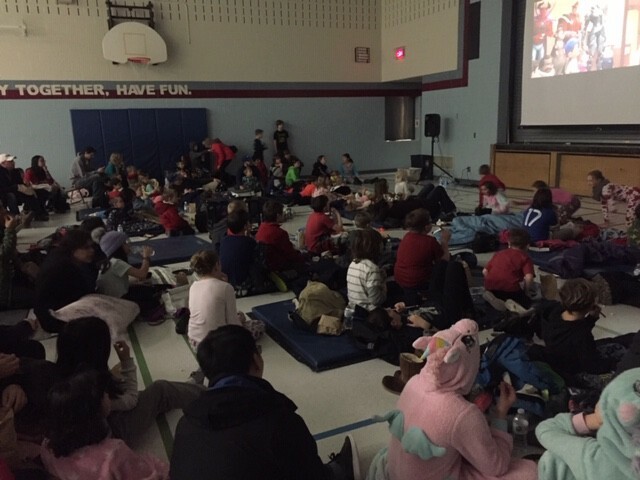 Thank you for making our Movie Night a big success. Movie Night was a fantastic success all around. 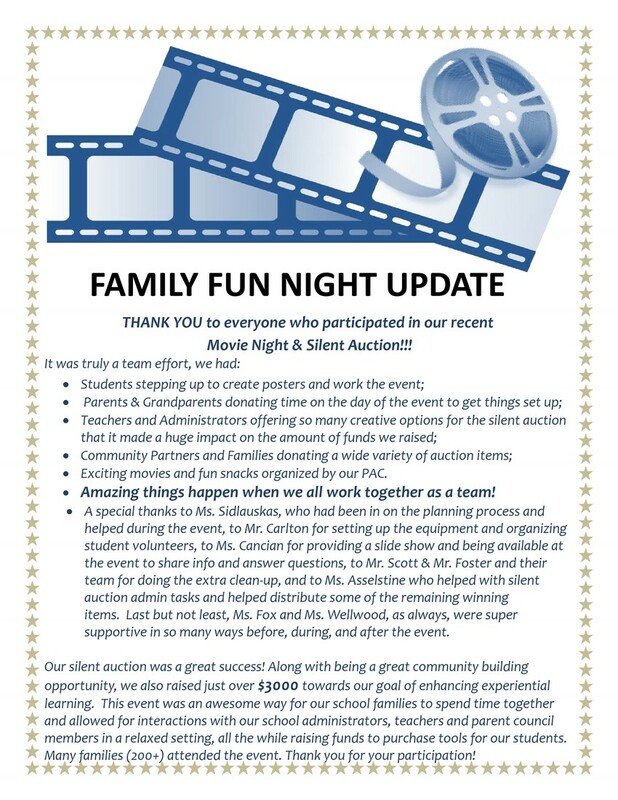 Great movies, great participation, and a very exciting auction filled with great donations from our supportive community. Thank you to our community for making everything a success. I would also like to take this time to not only personally thank, but to extend the communities appreciation to all the volunteers that made our movie night a success. The students who helped out with concessions and movie room supervision, the many parents (and grandparents) who did everything from ordering pizza to packing popcorn into little bags, everyone who turned our little school into a community cinema. You were all amazing! Students in Grade 6 that are interested in applying to Challenge, LEAP, or the Atlas program should be aware that the application and workshop process will be changing this year. The Choices at 7 website has been updated to include important dates, information about the process and FAQs. For information regarding these program please visit the website. The application will become available/live on the Choices at 7 website on February 5th. It will stay live until March 8th. Join Us For Coffee Time! Join Parent Council members on the first Tuesday morning of each month for Coffee Time. Come to the school yard early (anytime after 8am). Our next coffee time will be Tuesday April 2nd. We hope you have been enjoying the coffee and have had a chance to meet new parents! It is a great way to chat with Parent Council Members, Administrators, Teachers and Staff over a hot cup of joe! This fun community building event has been sponsored locally this year by Starbucks. I’m Madame Vooys. At the end of January, I began teaching grades SK/1-4 French at Lancaster, while Madame Walsh is at home with her new baby. I love teaching Core French because I had fantastic Core teachers growing up, who inspired me to pursue French as an adult. 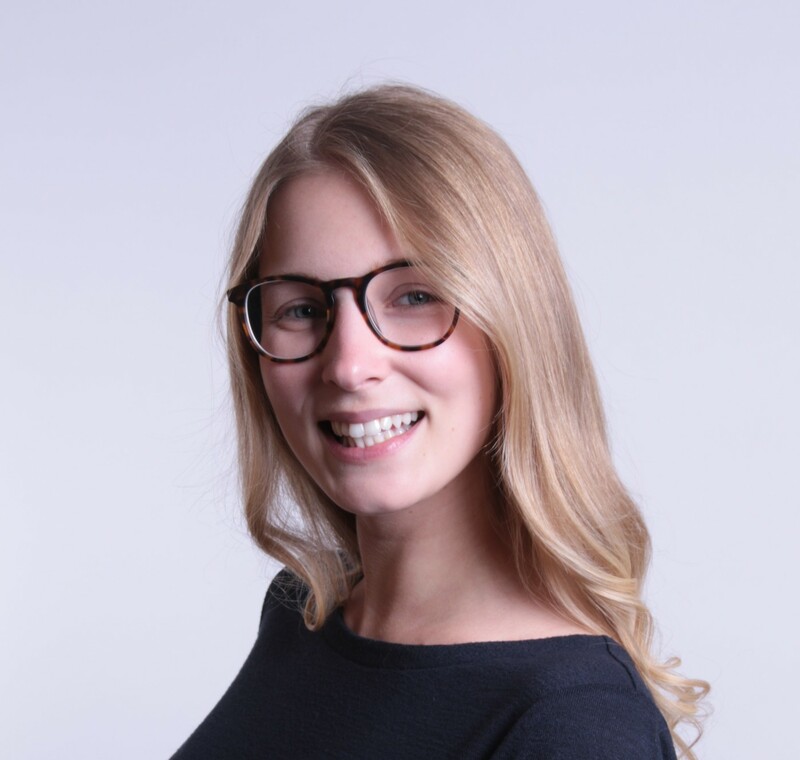 Learning French has enriched my life in many ways, from living and studying in France, to working for Médecins Sans Frontières (Doctors Without Borders), before returning to school to become a French teacher. I hope to inspire a life-long passion for language-learning among my students so that their lives may also be enriched by “la belle langue”. In French this month the grade 1s and 2s are looking forward to exploring French Canadian culture through “La Cabane à Sucre” or, the sugar shack, as we savour the traditions of the maple syrup season. Meanwhile, the grade 3s and 4s will take up “l’aviron” (the paddle), as we adventure alongside “Les Voyageurs”, exploring the history and cultural significance of the fur trade in Canada. If you’d like to enjoy our music for these units at home, check out the most recent additions to my public playlist (search Mme Vooys on youtube). Your kids would love to show you their favourites from class. Thanks for reading! If we haven’t had a chance to meet yet, I hope we will soon. À bientôt! 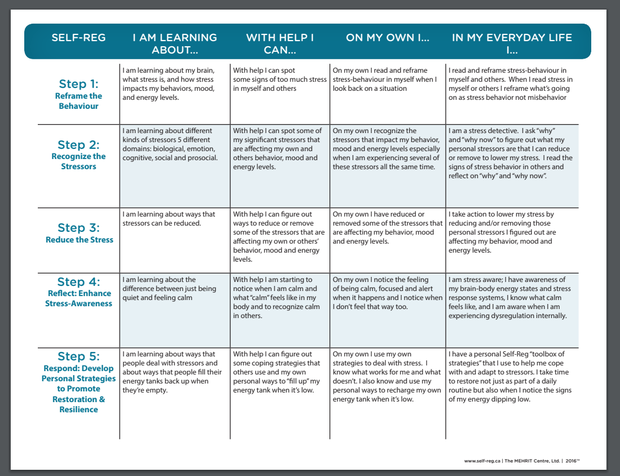 What is Self-Regulation: how can I help grow it with my child? There are three factors that affect self-regulation; sensory input, arousal level and personal strategies. Sensory input relates to how we interpret sensory information from our environments. Arousal level is our level of hightened sensitivity (high or low). Personal strategies relates to how effective our own calming strategies are for us. As we head back into another term of learning and adapting to day to day life at school, the following tips from the American Psychological Association remind us of ways to help our children develop resiliency and well-being well into adulthood. Teach your child how to make friends, including the skill of empathy, or feeling another's pain. Encourage your child to be a friend in order to make friends. Build a strong family network to support your child through his or her inevitable disappointments and hurts. At school, watch to make sure that one child is not being isolated. Connecting with people provides social support and strengthens resilience. Children who may feel helpless can be empowered by helping others. Engage your child in age-appropriate volunteer work, or ask for assistance yourself with some task that he or she can master. At school, brainstorm with children about ways they can help others. Sticking to a routine can be comforting to children, especially younger children who crave structure in their lives. Encourage your child to develop his or her own routines. While it is important to stick to routines, endlessly worrying can be counter-productive. Teach your child how to focus on something besides what's worrying him. Be aware of what your child is exposed to that can be troubling, whether it be news, the Internet or overheard conversations, and make sure your child takes a break from those things if they trouble him/her. At school staff can build in unstructured time during the school day to allow children to be creative. Make yourself a good example, and teach your child the importance of making time to eat properly, exercise and rest. 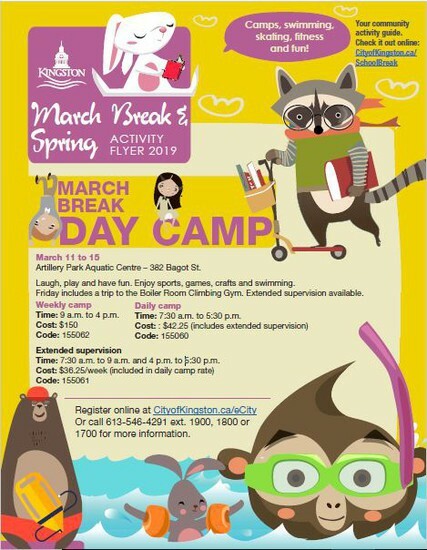 Make sure your child has time to have fun, and make sure that your child hasn't scheduled every moment of his or her life with no "down time" to relax. 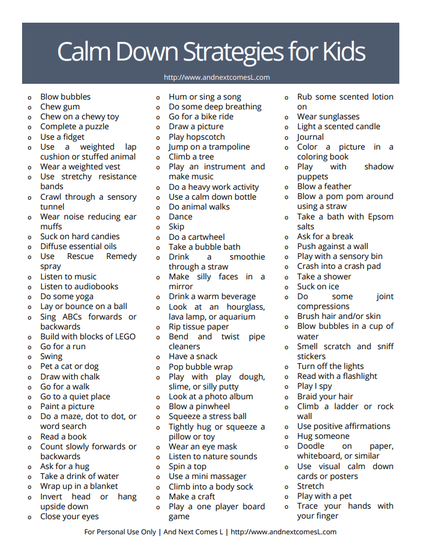 Caring for oneself and even having fun will help your child stay balanced and better deal with stressful times. Teach your child to set reasonable goals and then to move toward them one step at a time. Moving toward that goal — even if it's a tiny step — and receiving praise for doing so will focus your child on what he or she has accomplished rather than on what hasn't been accomplished, and can help build the resilience to move forward in the face of challenges. At school, break down large assignments into small, achievable goals for younger children, and for older children, acknowledge accomplishments on the way to larger goals. Help your child remember ways that he or she has successfully handled hardships in the past and then help him/her understand that these past challenges help him/her build the strength to handle future challenges. 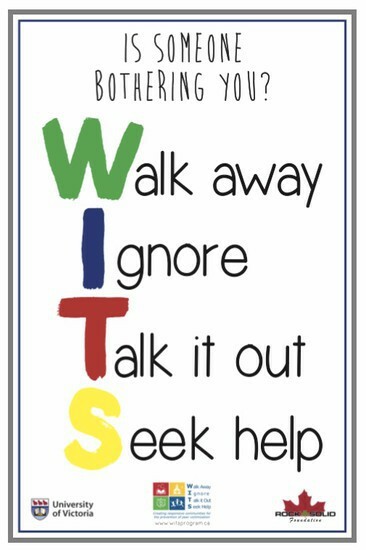 Help your child learn to trust themselves to solve problems and make appropriate decisions. Teach your child to see the humor in life, and the ability to laugh at one's self. At school, help children see how their individual accomplishments contribute to the wellbeing of the class as a whole. Even when your child is facing very painful events, help him look at the situation in a broader context and keep a long-term perspective. Although your child may be too young to consider a long-term look on his own, help him or her see that there is a future beyond the current situation and that the future can be good. An optimistic and positive outlook enables your child to see the good things in life and keep going even in the hardest times. In school, use history to show that life moves on after bad events. Tough times are often the times when children learn the most about themselves. Help your child take a look at how whatever they are facing can teach them "what they are made of." At school, consider leading discussions of what each student has learned after facing down a tough situation. Change often can be scary for children and teens. Help your child see that change is part of life and new goals can replace goals that have become unattainable. In school, point out how students have changed as they moved up in grade levels and discuss how that change has had an impact on the students. These tips have been taken from the American Psychological Association’s Resilience Guide for Parents and Teachers available at http://www.apa.org/print-this.aspx . 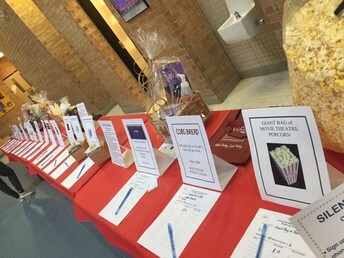 Movie Night - We raised just over $3,000 for Experiential Learning! 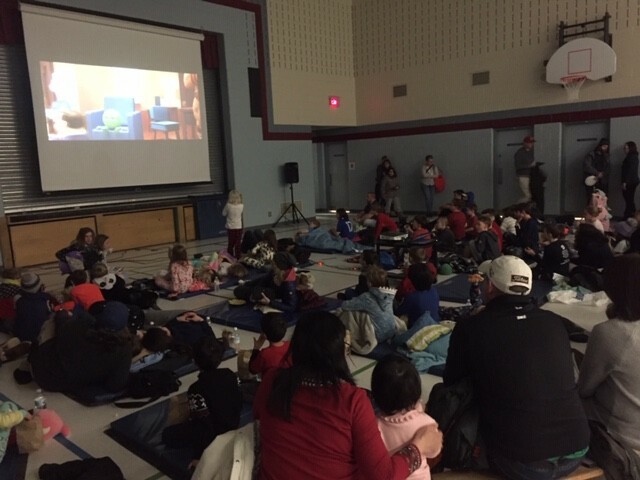 Thank you to the many parents who worked hard to plan, set up and run our successful Movie Night event. 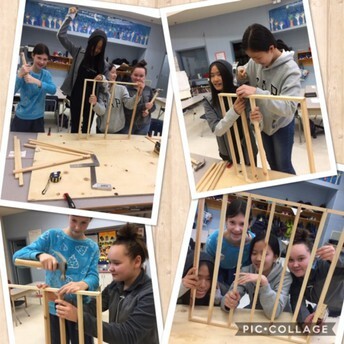 We also had great involvement from our intermediate students who were there to help in any way they could. Thanks to all!! At school, we continue to work with your child to help them to understand numbers. Here’s how you can help! Research tells us that in mathematics, higher achieving students have a stronger flexibility with, and understanding of, the relationships between numbers. Think about knowing 4 + 7 = 11 simply as a memorized fact. As a sound bite of knowledge it is useful but not transferrable unless we work with it in our sense of numbers and their relationships. What other numbers or facts is this connected to? Example: 6 + 7=? This is like the double I know of 6 + 6 and then 1 more. What do you know that might help you get there? Example: 7 x 4 =? I remember that 5 x 4 = 20, so then I have to add on two more 4’s, which is 8, to get 28. Doing Mathematics with Your Child (Kindergarten to Grade 6). 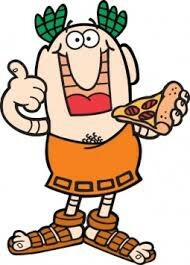 Our Little Caesars Pizza Kit fundraiser has raised $918. The money raised will go directly to supporting upgrades to our Kinder yard. Thank you very much for your support! Need labels for your kids belongings – simply hop onto www.mabelslabels.com and click on “support a fundraiser” scroll through until you see our school then do your shopping – 20% of all sales go to our school fundraising efforts – how easy is that!! 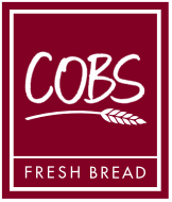 Love tasty baked goods from Cobbs Bread?? Every time you visit Cobbs Bread Bakery at 770 Gardiners rd. in Kingston simply let them know you are supporting Lancaster School’s Fundraiser and they will donate 10% of your sale to us! You can now shop online at your favourite stores and fund raise for Lancaster! 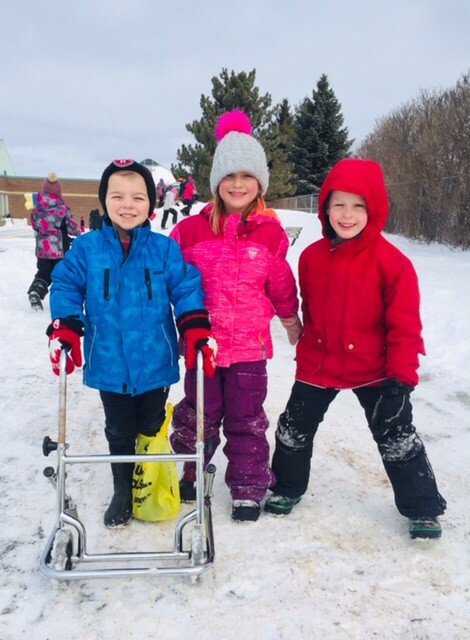 As part of our 2018/2019 Fundraising efforts, Parent Council is putting a 3 year plan in place to raise funds for schoolyard improvements for all divisions - primary, junior and intermediates. This is a significant project and will require a lot of hard work and dedication from our Parent Council, Staff and Community. FlipGive allows us to earn cash back for our school for shopping online! There are dozens of retailers to shop with including Indigo, Amazon, Walmart, Starbucks, Old Navy, Sport Chek just to name a few. You can even earn cash back for the school when you purchase gift cards - great teachers gifts or stocking stuffers! Going out for dinner? Order your gift card online through FlipGive ahead of time and use it to pay for dinner....So easy & something you were going to do anyway! Go to https://www.flipgive.com/teams/164409 and click on "Join This Team"
This fundraiser will run all year around so check back each time you shop online to see if there is a participating retailer. For a full list of current retailers, click here. Feel free to also share the link and code with family & friends - anyone can join our team! Every little bit helps. We appreciate your support. School Book Fair - Thank you! 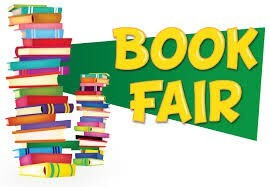 A huge thank you to all of the volunteers and families who supported the school book fair! Despite bad weather, we earned back 80% of sales in materials for classrooms and the library. Staff and students are grateful for your generous support! Happy reading! Having each of our students arrive and depart safely to and from school is of utmost priority and a shared commitment between home and school. In June we updated our families about the timeline for the parking and traffic project that has been developed as a joint effort of the Limestone District School Board and Algonquin Catholic District School Board to address the traffic patterns on Lancaster Drive around school drop off and pick up times. With this project slated to occur in the summer of 2019, we would like to make sure the Lancaster community is aware of and following the intermediary measures that are in place for student safety. Our school footprint within the community plan was designed to meet the needs of a primarily walking community. If your child, or you and your child, are able to walk to school please do so. This greatly reduces the congestion that occurs with the number of vehicles. Look into options of having an older student in your community walk your child to school as a “walking school bus”. Please pay attention to parking signs and do not park in places that are not designated as such. 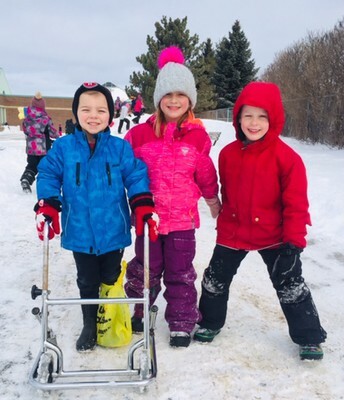 This reduces vision lines for other vehicles, for students who are trying to navigate their way to school and can also prevent our busses from entering their drop-off zone. It is essential that we are looking out for the collective not individual safety of our children. One person’s convenience can create very unsafe conditions for our students – please consider this at all times. When dropping your child off consider using some of the access points to Dunham park and schoolyard that are not out in front of the school. Arrange for the same meeting spot when picking your child up from school. These areas are quieter and offer more ease with finding parking and greeting your child at the end of day. Some of these access points can be found off of Limestone Dr., Irving Ct., Woodside Dr. (near Marsh Cres. and Crestwood Ave.) and Dunham St.
On inclement weather days when it is rainy or too cold for students to be outside staff will invite students inside at 8:15 when supervision begins and students will wait in the hallways until the bell rings under staff supervision. To ensure the hallways are not crowded parents should not be walking their child to the classroom door (especially on days like these) as it creates even greater congestion in the hallways and can have the impact of creating a more stressful environment for students starting their day. Thank you to our families for supporting safe arrivals and departures for all of our students. 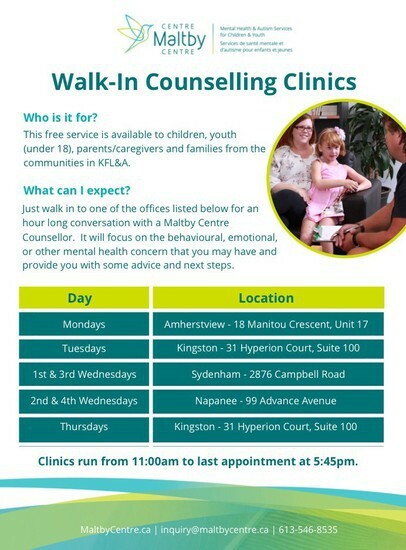 We are a community of caring adults and share this responsibility with you. The Limestone District School Board is excited to launch our new mobile app designed to enable students, families, staff and the broader community to stay informed about district and school news and events. 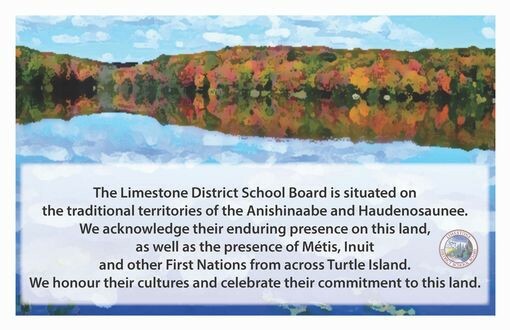 The free app (Limestone Dist School Board) can be downloaded for Apple in the App Store or for Android in the Google Play Store. Users can also select “push notifications” when they download the app to receive the latest news from the district and your school(s). The new app will allow users to subscribe to their schools of choice and will provide families with instant access to school calendars and news items as well as links to sports schedules, busing information and social media accounts. New information will continue to be added to the app. The mobile app is the latest tool in a new suite of electronic communication tools being deployed by the school board to improve communication with families and our school communities. New and improved district and school websites were launched in late spring. All schools will begin using a broadcasting tool called Communicate that allows the Board and schools to push important messages to students, families, and staff via voice mail, email or text message. The tool is linked to the Board’s student information system and families will choose how they wish to receive these important messages. Some schools are beginning the new school year with Communicate. All schools will introduce the tool by the beginning of October. 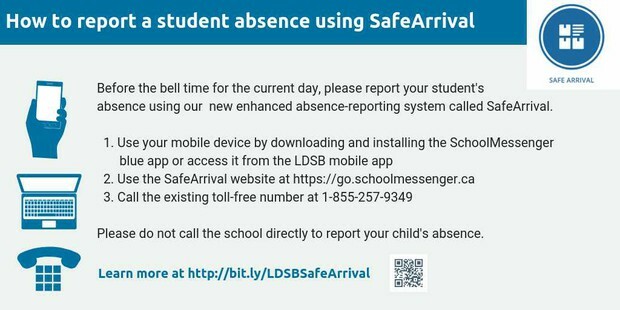 The Board is piloting Safe Arrival, an enhanced two-way absence reporting tool with Southview Public School this September. This new system will make it easier for you to report your student’s absence, reduce the time it takes for our school staff to verify student attendance, and respond to unexpected or unplanned student absences. Safe Arrival will be rolled out to all schools during the upcoming school year. Some schools in the Greater Napanee area will begin piloting a cashless payment system that will allow families to pay for field trips, hot lunches and other items online. The system will also schools to include any necessary permission forms to increase efficiency and privacy. We are excited to unveil these new tools to our school communities. We will share more information as each new tool is introduced. We thank you in advance for your patience and understanding as we improve to serve you better. Lancaster is happy to share that our students are able to register for instrumental music lessons that take place in our school building during the school day. 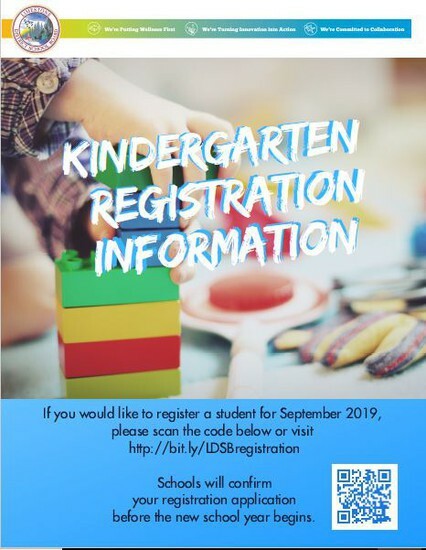 Please contact the music teachers directly if you are interested in registering your child/children for piano or guitar lessons.